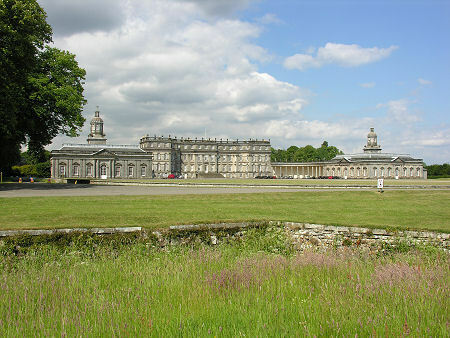 Hopetoun House describes itself as "Scotland's finest stately home" and in his 1769 book "A Tour in Scotland," Thomas Pennant described the house as "The handsomest I saw in Great Britain". That's a description that many of today's visitors would probably agree with. You approach Hopetoun House from Queensferry two miles to the east. From the elaborate stone gateway, the drive slowly climbs up a carefully graded slope, and the entire majesty of the east front of the house simply rises out of the surrounding parkland as you draw close. The impact remains as powerful today as it would have been in 1769. 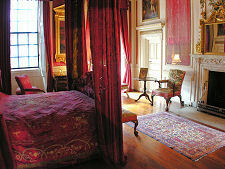 Hopetoun House lies close to the south shore of the River Forth, set amid well wooded parkland. It stands on ground that is high enough to give magnificent views across the river to Rosyth, and east towards the Forth Road Bridge and the Forth Rail Bridge beyond it. Yet because the ground continues to rise to the south, it is strangely retiring for a building of its size. 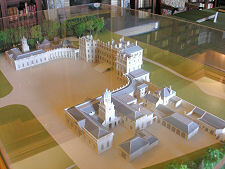 Hopetoun House was designed by Sir William Bruce for Charles Hope, who later became the 1st Earl of Hopetoun. 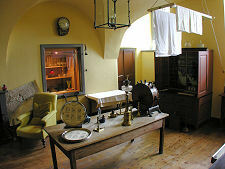 Work began in 1699 and the original house was completed in 1707. The basic arrangement, of a central main house flanked by two projecting wings, is reflected in what you see today, but the 1707 house was rather smaller in scale than what was to follow. Today's Hopetoun House is largely the result of the work of William Adam, who was commissioned in 1721 to turn an already grand and impressive house into a still grander and much more impressive one. The main house grew upwards by a floor and its east front was extended from 13 bays to 17. 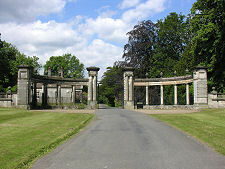 Meanwhile Bruce's original north and south wings were completely removed, to be replaced by more ambitious pavilions that extended further to the sides and to the front. 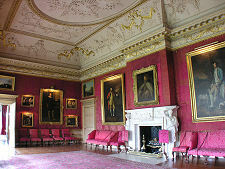 William Adam worked on Hopetoun House until his death in 1748, at which point the development was taken over by his sons, especially by John and Robert Adam, who oversaw the building of the pavilions and much of the interior decoration. The house was finally complete in 1767, much as you see it today. It is easy to forget that during the period of its construction, Bonnie Prince Charlie's Jacobite army passed by en route to Derby, and the Duke of Cumberland's pursuing army later came this way en route to their final destination at Culloden: a process that, amongst other things, led to the destruction of nearby Linlithgow Palace. Hopetoun House remains the family home of the Hopes, who retain the hereditary titles of Marquess of Linlithgow and Earl of Hopetoun. In 1974 the house and estate was placed in the ownership of an independent charity, the Hopetoun House Preservation Trust. The Trust's role is to manage and preserve the house with its historic contents and surrounding landscape for the benefit of the public for all time. 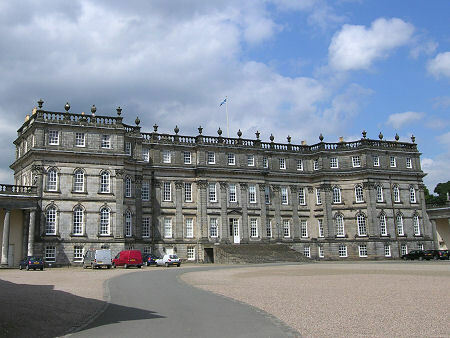 Today's visitors park near the ticket office to the south east of the house, and there is every opportunity to appreciate and admire Hopetoun House's imposing scale as you approach. After mounting the vast, unpalisaded flight of steps and going through the oddly modest front door, you find yourself in the Entrance Hall. The tour of Hopetoun House first takes you on a loop through the west side of the central main house, where the structure and many of the rooms themselves date back to the original design produced by Sir William Bruce. 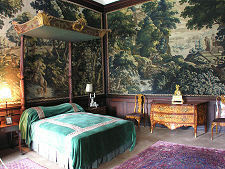 You then progress through the north end of the main house, home to the grand rooms installed by the Adam dynasty. 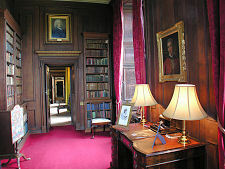 In the "Bruce House" highlights include the truly marvellous Large Library and the neighbouring Small Library. Here are kept the books the Hope family have collected over the centuries since 1650. From the Small Library you move through to the Garden Parlour, once primarily used to give access to the formal gardens that originally existed to the west of the house. A door from the Garden Parlour leads to the Bruce Bedchamber, a remnant of an original suite of three rooms designed by Bruce for the 1st Earl of Hopetoun. 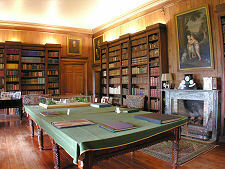 Also nearby is the Charter Room, designed to give protection to the Hope family's important documents. 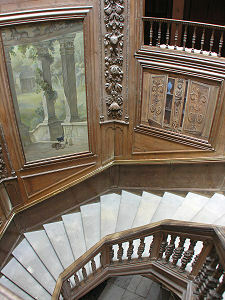 Before leaving the "Bruce House" you mount the incredible Front Stairs to the first floor, where you find two more bedchambers including the White Satin Bedroom. But the highlight of the first floor must surely be the stairs themselves, contained within a remarkable octagonal structure surrounded by intricately decorated panels. 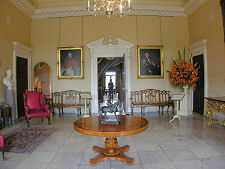 Back in the Entrance Hall you progress north through a series of huge rooms that comprise much of this end of the house. 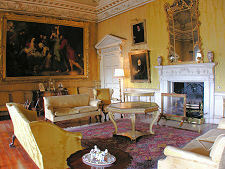 The first of these is the Yellow Drawing Room, which retains a sense of a real - if large - family living room. 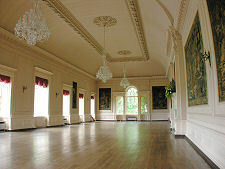 The Red Drawing Room is built on an even larger scale and has a stunningly decorated ceiling. Next on the tour is the State Dining Room, a room in which just about everything dates back to its creation by the architect James Gillespie Graham in 1821, out of what had previously been a bed chamber and an anteroom. 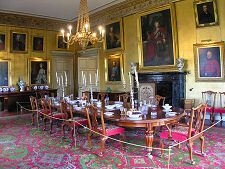 King George IV had lunch here when he visited Hopetoun House on 29 August 1822. It is recorded that he had turtle soup and three glasses of wine. Beyond the State Dining Room you may want to climb the 92 steps to the rooftop viewing platform, which offers superb views over the house, the estate and beyond. 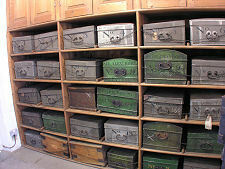 Having done so (or if you choose not to) you then descend to a service corridor off which you find the Butler's Pantry. Beyond this is an interpretive exhibition about the conservation of the house and its contents: and then you are back outside. On your way back to the car park, make sure you take a look in the south pavilion. 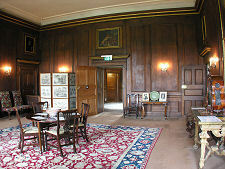 Here you find an annex leading to the Tapestry Room; and to the Ballroom. The latter was designed by William Adam as a (truly vast) library, but by 1881 was being used as an indoor riding school. That was when it was converted into the Ballroom, a room which, by eye, appears to be rather larger than the Great Hall at Edinburgh Castle, but probably rather smaller than the Great Hall at Stirling Castle. The grounds at Hopetoun House are extensive and include a considerable expanse of river frontage. They can be enjoyed in their own right without visiting the house itself, as can the Grounds Discovery Centre and the Adam Stables Tearoom, both housed in the north pavilion.